After receiving a standing ovation at the Maine International Film Festival (MIFF) and a very warm welcome at MIFF By-the-Sea, featuring “the best of MIFF,” TIME AND CHARGES screened at the Big Apple Film Festival in New York City, receiving an equally exultant response. Encompassing nearly four years from inception to completion, TIME AND CHARGES was offered by Ernest and his Whitebridge Farm Productions partners Morgan Murphy and Lori Gigliotti Murphy as On Location Training for anyone of any age interested in any aspect of filmmaking and drew more than 500 actors, extras, designers, composers, crew members and volunteers. Shooting primarily on Sundays, to accommodate everyone’s day jobs, TIME AND CHARGES has what no Hollywood movie could ever afford: four seasons. Ernest and cinematographer/editor Jamie Sharps commandeered Ernest’s daughter’s bedroom and spent another year cutting, reshooting, reshaping and polishing. Ernest wrote the lyrics for ten of the songs on the TIME AND CHARGES soundtrack, working with six different composers, principally New Hampshire native Joe Deleault, who also created the movie’s haunting score. 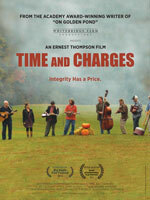 “TIME AND CHARGES has been the most fluid and ongoing project I’ve ever worked on,” Ernest has said. “And among the most gratifying.” And now it’s time to share our amazing story with a greater audience. Jeremiah Ward, a hot shot New York money manager, turns off the highway, straight into his past. In rural New Hampshire, he discovers confusing clues and ghostly reminders of not only people he knew forty years ago, but of the person he once was: an idealist, a visionary, whose clarity grew dimmer with each acquisition and every brilliant move on the career chess board. Exit 22-A seems to represent a portal connecting him with the values and virtue left behind, but it turns out to be much more. Melody, the daughter he never knew, has created the entire artifice, the road map and the cast of characters, determined to test Jeremiah’s true convictions and to change his life. And, in doing so, saves it.